The Windsor knot is also known by the names double Windsor and Full Windsor to distinguish it from the half Windsor knot. It produces a symmetrical, wide and triangular necktie knot. The large self-releasing knot amply displays the tie design and fabric when worn with a closed coat or jacket. It can also keep your throat warm in winters. It holds tight and doesn’t slip away when tied perfectly. You can do it easily and quickly after some practice. 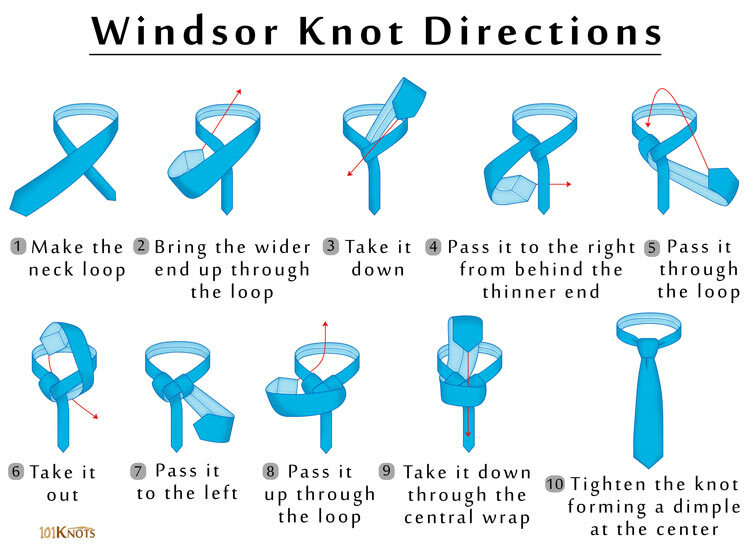 The knot is thought to be named after the Duke of Windsor who was known as King Edward VIII, before his abdication. However, it is likely to have been invented by his father, George V. The Duke had a preference for wide knots and specially made his neckties with thicker cloth so that it produced a knot wider than the conventional four-in-hand knot. 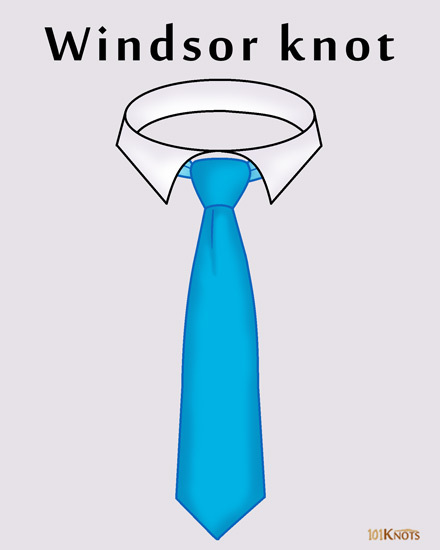 The Windsor allowed him to make a similar fat knot with ties of normal thickness. Though it is commonly used in the armed forces including air cadets, certain sections of the UK army deem wearing it inappropriate since the Duke of Windsor abdicated the throne. The below step by step diagram with instructions is beginner friendly. The ideal length of the tie should be around 1.6 inches to 4 centimeters more than a regular tie or else it could make your tie too short after tying. Wear it to flaunt a trendsetting style even with an ordinary tie. It suits cutaway and spread collars and should not be teamed with straight point shirt collars (whose points spread out at an angle less than 60 degrees). It doesn’t look good on skinny and knitted ties. It can be tied on cravats and scarves too. It is appropriate for job interviews and formal occasions (like business meetings, weddings) but should be avoided in relaxed settings. Many people feel that it looks too big on men with small faces as instead of accentuating the facial frame, it draws attention away from it. Men with wide faces, though, wouldn’t have issues with it. For untying it the correct way, loosen the knot first by pulling it gently from side to side and back and forth. This will make the back end come out. Half Windsor knot – It is smaller, about three quarters the size of the full Windsor. The four-in-hand knot is smaller and it suits all types of collars unlike the Windsor. You can watch Sean Connery as James Bond wearing this classic knot in his ties in the movies Diamonds Are Forever, Dr. No, etc. Ian Fleming, the author of the James Bond novels, however, was not too fond of the knot. In his novel, From Russia, With Love, he had mentioned that Bond couldn’t trust someone who wore a Windsor tie knot. It showed too much vanity and was often a mark of a cad. However, later the secret service agent got rid of this prejudice. Harvey Specter, the lead of the TV series Suits, made a style statement with the traditional knot in his power ties. This is a regular view of the simple knot as seen being made by a person standing in front of you, face to face. This video gives you a view of tying the knot from above, just as you would see it while making it yourself, without looking into a mirror. Pratt knot – Though a tad smaller, it is more flexible and equally symmetric.